The BlackBerry Q5 is a low-end BlackBerry device with a 3.1" touchscreen and a re-engineered keyboard that runs the BlackBerry 10 operating system, presumably designed to replace the Curve line of messaging devices. 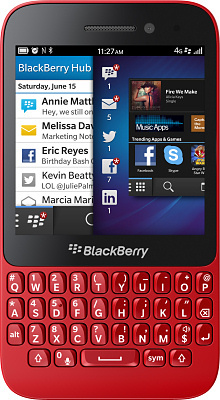 As with the more expensive Q10, the Q5 supports BBM and other social networking and photography features although this is a much more basic (and cheaper) device. We'd like to tell you more, but in what has to be one of the most catastrophically messed-up product announcements we've seen in recent years, BlackBerry have completely neglected to mention what the specifications of this device actually are, or how much it will cost. Presumably BlackBerry think these details are unimportant. There's a good chance that the Q5 will become irrelevant anyway as BlackBerry have announced that they are porting their BBM messaging application to Android and iOS. This will almost definitely have an adverse impact on demand for the Q5. It's worth noting that the stock markets wiped 8% off BlackBerry's already struggling share price after these announcements. If you are still in love with BlackBerry devices for sentimental reasons, then BlackBerry say that the Q5 will be available in most markets outside North America from July onwards.